Bloat is a condition involving the digestive tract. It occurs when the stomach fills with air, inflating much like a balloon. The emergency happens when bloat turns into what’s called a GDV, or gastric dilatation volvulus. This occurs when that balloon of a stomach turns on itself, trapping the air, food, and fluid in the stomach and strangulating the blood supply to the stomach. Sometimes the spleen, which is a close neighbor to the stomach, also twists in the process. 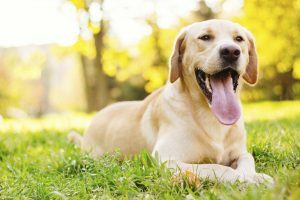 Don’t delay if your dog is displaying any of these symptoms. While it may turn out to be no big deal, we would rather you be safe than sorry. Some pets are at higher risk of suffering an episode of bloat. These include breeds that have a deeper chest shape such as Weimaraners, Great Danes, Bassets, Shepherds, and Setters. Any breed can bloat, however owners of these breeds should be on extra high alert. When a dog is suffering from bloat, there isn’t much you can do at home. Minutes can make a difference between a good outcome and a not-so-good one. Do not hesitate if you suspect bloat since your dog’s best chances are in the hands of our trained, expert veterinary staff. Call us right away if you are concerned. If a pet is suffering from a GDV, it is important for us to treat the shock that often accompanies it. Most often bloat is a condition requiring surgery and intensive postoperative care. Should you find yourself needing to have a pet treated for bloat, know that at Oakland Veterinary Referral Service, you are in the right place.